Some cities are like magnets; their poles attract you without reason. You don’t visit them for official work, relatives or distant cousins but for some weird reason as if the city’s randomness is your true calling. You visit them like a hermit seeking solace. And every visit is marked by a longing – to meet a lost childhood friend. Some cities are like magnets; their poles attract you in with their own reasons. Chandigarh is one such city. Those who have been enamored by it will vouch that serendipity has a beautiful face. 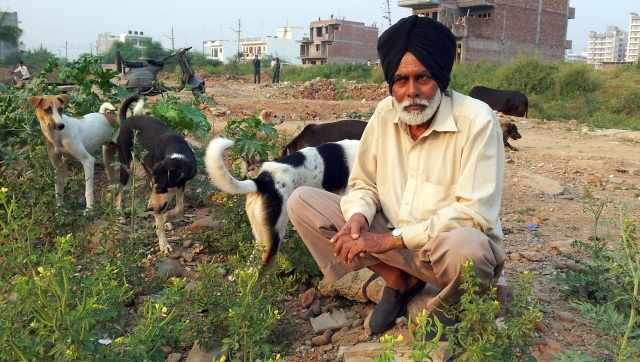 In my last visit to Chandigarh, I met Sardar Baljeet Singh, an ex-service man who has fed dogs for decades now. Day in and day out, for 20 years, the gurgle of his olive green scooter’s engine has resonated to scores of wagging tails. Stripped of every colour but joy, words leak from his lips as he introduces me to the clan. Their names, peculiar habits and the stories ─ a fable for the eyes to see. 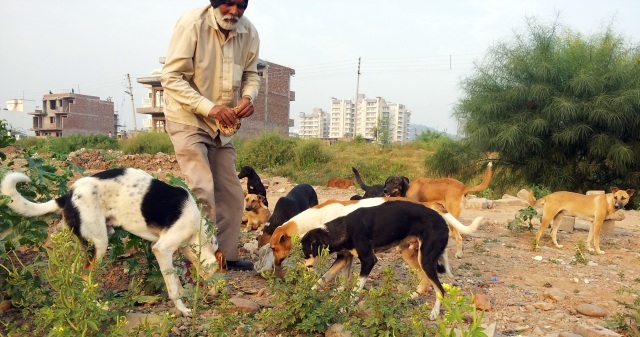 This Chandigarh dog lover reminds me of Hanuman. In a distance the day was fading, orange sun milking the remains of the day as Sardar ji continued playing with his friends. I will always remember him as this time of the day.